Bharat Sanchar Nigam Limited (BSNL) one of the most popular Indian telecom company. Many users use BSNL service because of its Network availability. 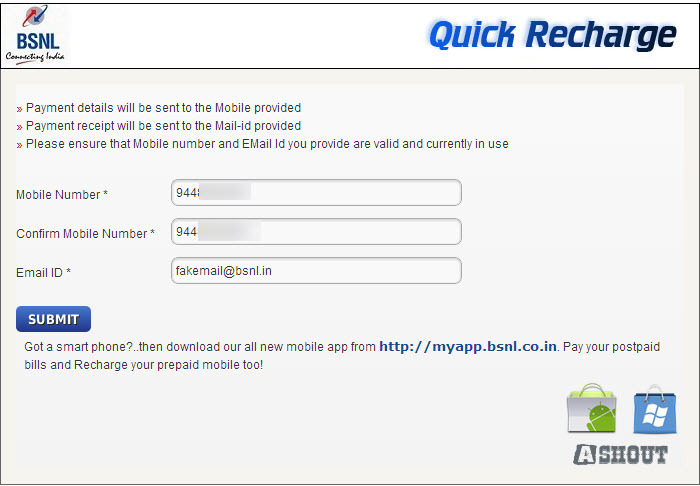 Did you know that we can check the balance of any BSNL mobile number online by just providing only mobile number? Yes! Below tutorial doesn’t work anymore. BSNL fixed this. Instead of using this method to check BSNL Number Balance use the below USSD Code to check your BSNL number balance. You can visit here to know more BSNL USSD codes. In this method what we are going to do is– We visit BSNL Quick Recharge service page, and we try to do a recharge for that number. Before you taken to the payment page, it will show Balance and validity details. It’s that simple to get details. 2. Enter any BSNL mobile number that you wish to know balance details. In Email ID filed you can provide any fake email address and click Submit button. After choose General Topup, you will get an option to choose recharge amount. Choose any amount from that dropdown menu and click Submit. 4. In the next step you will get balance and validity details of that BSNL number. This is really a serious issue. Any hackers can use this information to hack that user online accounts by social engineering method. For example, Hackers could call that users and get some personal data by pretending they are calling from BSNL service centre. With the above information they could build trust with users and ask further personal data which will be helpful to hack online accounts. BSNL should really fix this issue. If you are BSNL user, then you should be aware of this issue. So that, if any user called you by providing Balance and Expiry date, you should not reveal any personal data to those callers. Can u help me to get the mobile balance and expiry of phone. I need to know the balance information. i need to know balance of my best friend ! Login to the BSNL portal (http://portal2.bsnl.in/myportal/workspace.do#). You can use gmail/twitter account to login. Once you logged in, you can see the “Check Balance” under “Recharge” menu item. my bsnl sim 8986815904.i have kept it out from my mobile for few days when i re enter my sim to my mobile handset its showing registration failed. than i have gone to my near by bsnl office the said we cant do anything. plz help me in my sim there way was my very inportant data. I am not satisfied with BSNL …..
My bsnl mobile number -759869337. Pls let me know the balance & validity date.pls send reply only by mail only. ryuvaraj619@gmail.com. I am Somaiah from Karnataka. As of now, I am working in Kuwait. I want know about my BSNL SIM validity. Can you please send me the details to my E-Mail address. It will be a great help, if you can get me the details.